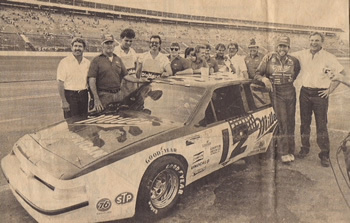 CONCORD, N.C. (Sept. 27, 2018) – As the NASCAR drivers, teams and fans head back to Charlotte Motor Speedway for the annual fall racing weekend, veteran motorsports management pro Benny Ertel recalled a special race held there 32 years ago. The official results sheet shows that Ertel drove the No. 12 Miller American Pontiac from a 12th-place start to a 12th-place finish in the Oct. 1, 1986 Bullfrog Knits 150. In reality, no documented statistics will ever fully explain what occurred during that Charlotte/Daytona Dash Series event on the 1.5-mile CMS quad-oval. 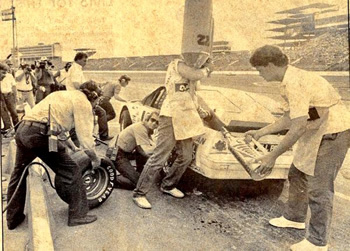 To trace how racing’s absolute “dream team pit crew” came to be assembled, one has to begin at the roots of Ertel’s relationship with Bobby Allison. Ertel was a Milwaukee native who in the early 1980s was running pubs, serving as a part-time TV sports reporter and actively racing at the grassroots level. 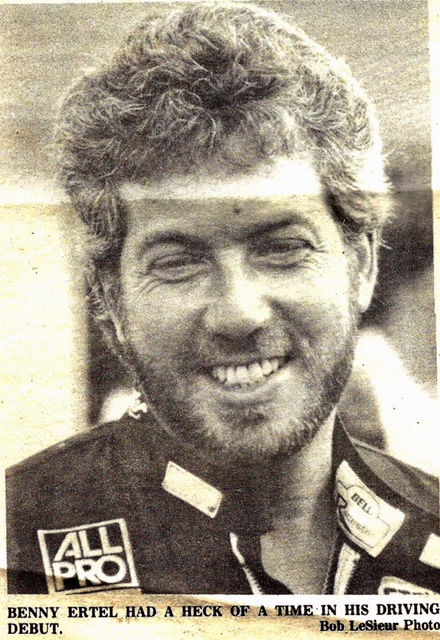 During the 1986 season, Ertel was busy booking appearances for Allison, traveling with him extensively and even spotting for him on race day. The idea to compete in the Dash Series race at Charlotte was the direct result of what happened during the August race weekend at Talladega. “We were racing at Talladega that summer and Bobby actually put me in one of his cars out of his Hueytown shop in a race out at BIR (Birmingham International Raceway) when he couldn’t be there,” Ertel said. “Hut Stricklin was there helping us out. We ran strong enough that night that Hut suggested I give it a try in a Dash Series race. I liked that idea and started putting things together for the Charlotte race, which was one of the biggest races of the season. I was able to get a ride in Mike Swaim’s backup car. He was driving for David Watson’s team out of Boone and those were some proven winning race cars. I had become great friends with Tom Kleiber, Bruce Mueller and Eddie Gossage at Miller Brewing and they were happy to sponsor us in the race. I even reached out to Phil Holmer at Goodyear and he donated the tires for the race. 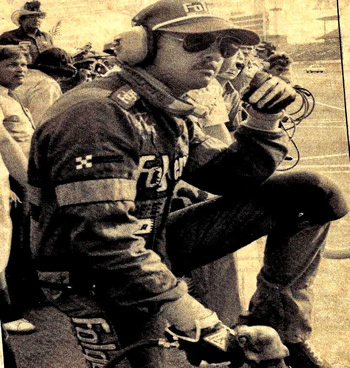 When Ertel began to discuss the details of the race day at Charlotte, it was as if time had traveled back 32 years earlier with his vivid description. When the green flag was waved to officially start the race, no one really knew what to expect – both out on the track and on pit road. To do the situation justice, here is Ertel’s account of what happened during the 62-lap, 150-kilometer battle. His explanation actually required more than 20 minutes as it was interrupted numerous times by uncontrolled laughter by both interviewer and interviewee. “I’ll never forget the pre-race chatter on the radio and taking the green flag that day,” Ertel began. “BA was trying to stay on top of things and was keeping it as organized as possible. We were only a couple of laps into the race when I blew a tire and had to pit. The first stop, they looked like the Keystone Cops out there. Everyone wanted to help and pitch in, but with no practice, we had guys going in every direction. There were a couple of distractions to deal with, too. We had more fans standing around our pits than were sitting up in the stands. Tim Richmond had won the pole for the Cup race. He was still in his uniform when they came to get him for his post-qualifying interviews. “After the first pit stop, the NASCAR officials warned BA that we had too many men over the wall,” Ertel said as he started to chuckle. “But somehow, BA was able to convince the officials that it wasn’t the total bodies over the wall that counted…it was the number of feet. 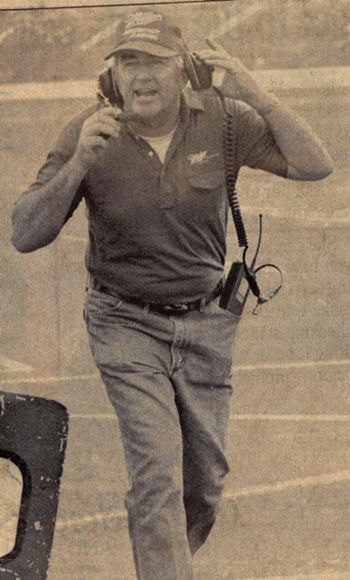 I laughed out loud when I heard that BA told the official working our pits that he’d taught all of his guys to do their jobs just using one leg. 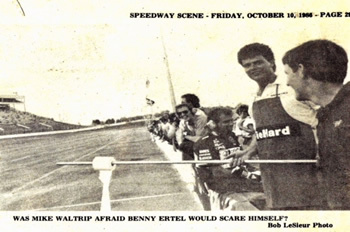 “After my second spin during the race, Neil refused to come over the wall,” Ertel said with a laugh. “Ruttman was supposed to be using the drink stick to give me Gatorade, but instead welcomed me with a roll of toilet paper, suggesting I might have had an accident in my pants after spinning like that. With Benny Parsons sitting up in the condo in Turn 1 and spotting, he was able to coach me to run the fastest line around the track and we actually got to running some decent lap times out there. “During the next pit stop, Richmond had returned from his interview session and went over the wall to change tires,” Ertel said. 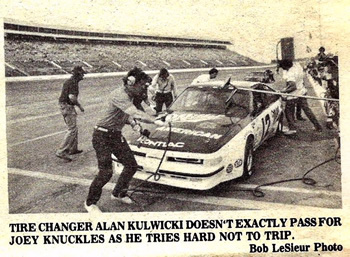 “Somehow, he and Rusty got to bickering and they actually put the tire back on that they had just taken off, so I had to hit pit road a second time for tires. At one point, we were running two laps down and able to make up one of those laps. “We were running really well with about 10 laps to go, when BA came on the radio and told me to pit the next time by. I told him that the car was handling and running the best it had all day long and there was no need to pit. I’ll never forget what happened next. He said, “Pit…pit…pit…the guys want to do another pit stop…get that thing on in here!” Of course, I followed my crew chief’s orders and pitted the next time around. The guys reeled off a perfect pit stop that was lightning fast. And it was the greatest all-star pit crew ever assembled for a race…that’s for sure!